Nice home in Shadow Ridge Estates on 3/4 acre lot with established yard and landscaping with privacy fenced yard, storage shed, and gas log fireplace on the spacious patio. This approx. 2300 sq. 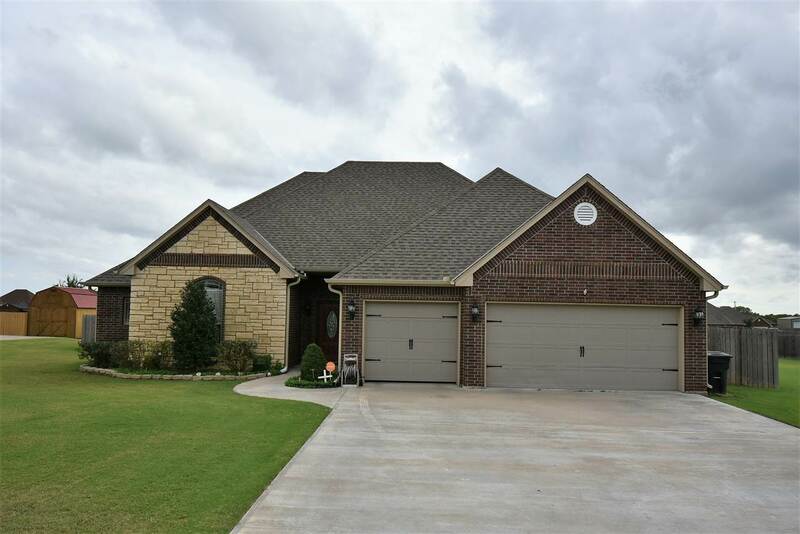 ft. beauty has 4 bedrooms and 2.5 baths with lots of storage throughout. Tile and laminate flooring throughout except the bedrooms. Natural gas fireplace in the living and patio. Open floor plan with double tray ceiling in the living room. Kitchen has custom built cabinetry, granite, large breakfast bar, pantry, stainless appliances, and pot filler. Nice sized master suite and master closet adjoins the utility room. Home comes with blinds, security system that is rented, water softener that is owned, full guttering on home, and surround sound in the living room. Dining Room Size: 11&apos;6" X 11&apos;6"
Kitchen Size: 16&apos;7" X 12&apos;1"
Living Room Size: 19&apos;2" X 15&apos;2"
Master Bedroom Size: 15&apos;5" X 14&apos;0"
Utility Room Size: 10&apos;0" X 6&apos;7"